According to the internet it’s thousands of startup accelerators programs & incubators out there, looking for the most talented startups to accelerate. What started with Y-combinator back in 2005, was followed by Techstars, 500 startups and a couple of thousand other organizations which now all are competing for the same talent, according to Angel Garcia, director of Startupbootcamp IoT, Data & Cybersecurity in Barcelona. It’s turning into a very crowded space, it’s much harder to find good startups for every round we do. Online I’ve seen lists of thousands of so-called accelerators. Many of them provide mentors, a table to work at and other perks, but they don’t run sustainable businesses. 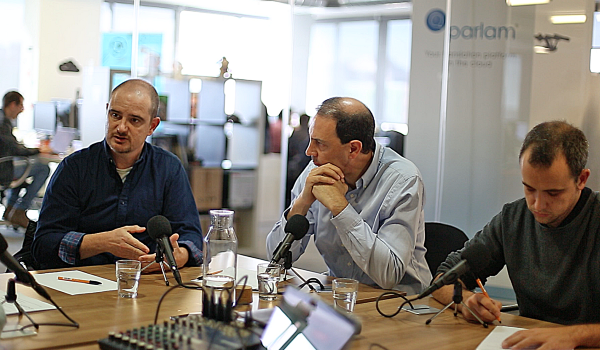 From the left: Angel Garcia (Startupbootcamp) Patricio Hunt (Intelectium) & Bernat Farrero (itnig). Just like venture capital investors, both accelerators and incubators are betting on a large volume of projects, and hope one out ten get’s a big exit. In practice, we’ve had virtually no time to see any of this models succeed just yet, even the few biggest ones have kept growing their expectations and none has yet consolidated and shown a real business success case. Unlike most accelerators that are funded by VC’s, Startupbootcamp is funded by corporations that all get access to the products the different startups are creating, according to Garcia. We’re different from most of the accelerators out there. It’s not only our business model, but 82 percent of our startups that have gone through our program is still going, and that’s a high number. Both Farrero and Hunt used to run accelerator programs, but later chose to leave the space to dedicate a deeper focus on fewer projects. If we look at all of the accelerators today, both the ones we call successful, and all the others, I’ve never heard of anyone being profitable. Startup studios or venture builders has been gaining more and more tractions lately, with studios like eFounders, Betaworks, Idealab & itnigpumping out new companies annually the last years. Also Patricio Hunt, managing partner at Intelectium has been transitioning over to an approach of building talented teams, instead of accelerating already existing startups. We have, as Farrero, evolved into more of a venture builder the last years. We study the markets, talk with corporations and possible future customers, and create products we know are needed. Instead of using valuable time on accelerating tons of projects, we are using that time to study the markets and current trends, as well as attracting the best talent to come work for us. Even though Startupbootcamp is working with a different business model, also Garcia stresses the importance of knowing your markets. As we work in industries where everything is changing very fast, we need to understand the markets better than most people do. The amount of accelerators getting started is not decreasing, but as the amount of programs increases, the less credibility the accelerator gets. All the three directors agree that the few accelerators with an established brand will survive, and so will the ones that have implemented sustainable business models, but the rest will have to pivot or innovate into something new, something startups actually need.